EXPAND YOUR GSC MARVEL KEYCHAIN COLLECTION WITH GUARDIAN OF THE GALAXY VOL.2 ADVANCE TICKET! Be the first 1000 customers to get this limited edition Starlord Keychain when you purchase Guardians of the Galaxy Vol. 2 advance tickets on 14 April! Obviously. 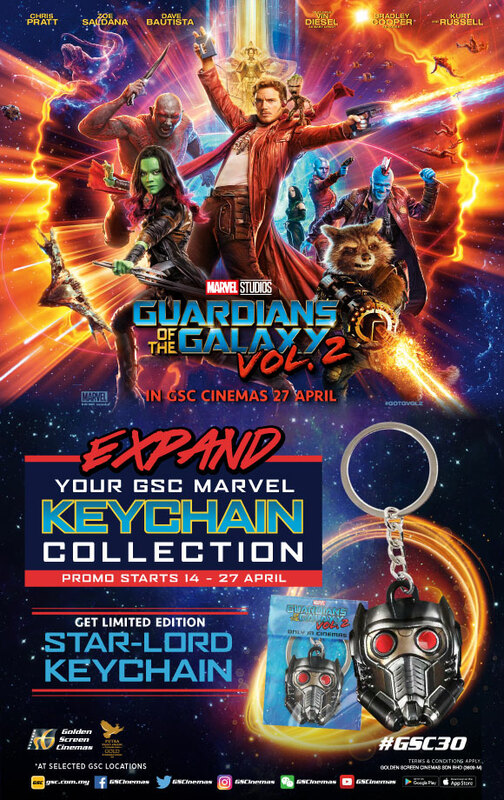 Purchase TWO (2) or above, Advance Tickets of Guardian of the Galaxy Vol.2 and GSC E-Combo via GSC Mobile or GSC Website at selected GSCinemas Location to get ONE (1) LIMITED EDITION STAR-LORD KEYCHAIN. First 1,000 customers, on a first comes first served basis, will be contacted on 25th April via email. Winner Letters will be sent and customers are required to redeem LIMITED EDITION STAR-LORD KEYCHAIN. The promotion is valid for purchase over GSC Mobile App & GSC Website at above GSCinemas locations. First 1,000 customers to be eligible for said promotion will be contacted via email with Winner Letter. Customer is required to print out said document and show to cinema staffs altogether with IC, when redeem the Keychain. The location of redemption is the same as where the tickets are purchased from and redemption will be made at Box Office counter. Promotion starts 14th April, as soon as Guardian of the Galaxy Vol.2 movie tickets goes on sale. Late purchase will not be eligible and appeal will not be entertained. Purchase TWO (2) or above, Advance Tickets of Guardian of the Galaxy Vol.2 with GSC E-Combo to redeem ONE (1) LIMITED EDITION STAR-LORD KEYCHAIN. Each customer is eligible to win only ONE (1) LIMITED EDITION STAR-LORD KEYCHAIN. The prize must be taken as stated and cannot be deferred, non-transferable and not redeemable for cash. ONLY redeemable at the cinema stated in the ticket. (Example: Tickets purchased at GSC 1 Utama, can ONLY be redeemed at GSC 1 Utama). Visual is for illustration purposes only. GSC reserves the right to cancel this promotion at any stage, if deemed necessary and/or if any circumstance beyond its control arises.